“Sourdough” revolves around Lois Clary, a software engineer from Michigan who moved to San Francisco after being wooed by the robotics company General Dexterity. One day, she finds a menu for a small restaurant run by two brothers in her neighborhood. She soon becomes the small business’ No. 1 customer. When the brothers are forced to close down because of trouble with their visas, they give Lois their sourdough starter and tell her to talk to it, play it music and bake with it. Once she gets the hang of baking, her bread gains popularity and she gets invited to a shady underground farmer’s market that is literally underground. The venders use technology to push the limits of what humans can do with food. One such vendor who is known as “the microbe whisperer” makes cheese that is enhanced and strengthened through microbiology. Another is a young bagel company with geometrically pleasing bagels called NewBagel that is a nod to Sloan’s first book. One lady is making bread, scones and other baked goods with crickets. This experimental market is trying to bring a new way of experiencing food to the public and Lois jumps right in by teaching a robot arm how to bake bread. This opens up a whole new set of adventures that leads Lois to discover what she wants to do with her new skills and her life. Robin Sloan is one of the best writers of modern fiction under 40. His first book is a New York Times best-seller and NPR named it Best Book of the Year. 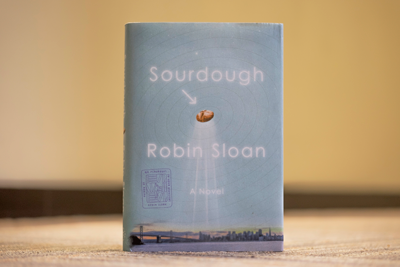 In “Sourdough,” Sloan focuses on his own home base of Oakland, Berkley and San Francisco, writing descriptions that make readers feel as if they are in Northern California with the main character. Throughout his second book he has hidden several Easter eggs from the first novel, which felt like inside jokes between the author and reader. This is where Sloan excels. He pulls reader in and makes them feel like they are a part of the story. He rewards the detailed reader with subtle hints that make the resolution sweeter, but he doesn’t lose the casual reader with his exposition. His writing is comfortable and relaxed while also containing a deeper note to it, which makes re-reading his novels a must. His descriptions of scene and setting places the reader right in the middle of it, whether it be on an abandoned airfield or in the cafeteria of a San Francisco start-up. His use of the main character’s inner monologue is clever and never overdone. And while it reveals everything the main character knows, his build up to key plot points is never spoiled. With “Sourdough,” Sloan dives headfirst into the subjects of food, science and food history and explains it with a simple but compelling narrative for the technological world of today. He weaves complex explanations of programing and microbiological organisms with jokes about twerking. He even adds a love story into the plot, but it’s subtle and therefore more sincere than most. “Sourdough” is another feather in Robin Sloan’s cap of fusing new technology with old school sensibilities. Everyone should read it. This is a book for those who love food, those who love technology and those who love a great story.